Founded: 1982 as MIPS Computer Systems Inc. Specialty: Fab-less semiconductor design company. Developed RISC architecture and RISC microprocessors for high-end workstations. Designed the Sony PlayStation / PlayStation 2 & Nintendo 64 video game console processors, and Processors for home electronics including portable media players, Blu-ray Disc players, digital TV's & set-top boxes. 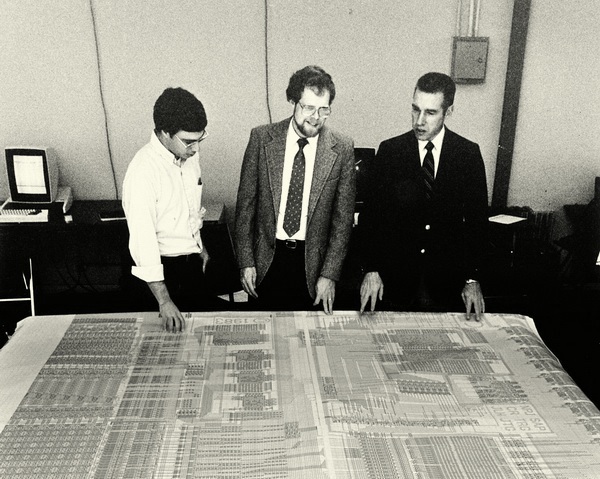 ​ Silicon Graphics (SGI), AT&T, Pyramid Technology, Tandem Computers, Siemens-Nixdorf, Sony, Cisco, NEC, Tektronix, Digital Equipment Corporation (DEC), Network Computing Devices, NeTpower, and QMS. 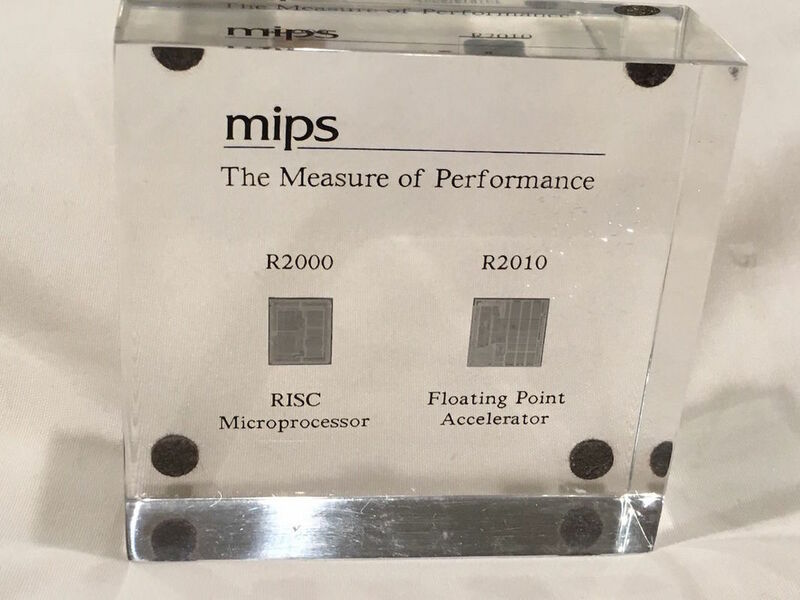 ​This Lucite paperweight from MIPS Computer Systems features their R2000 RISC Microprocessor, and an associated R2010 Floating Point Accelerator co-processor chip. The MIPS R2000 was the world's first commercially available RISC microprocessor. 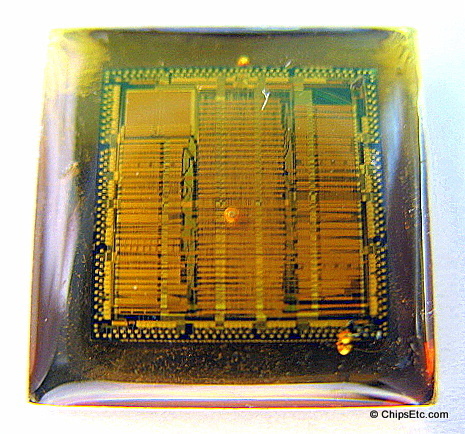 The R2000 was a 32-bit CMOS microprocessor. It was offered in clock speeds from 8 to 12 MHz and used the MIPS-1 instruction set. The MIPS R2000 chips were designed by MIPS, but would be manufactured under license by various semiconductor manufacturers including Integrated Device Technology (IDT), LSI Logic, Performance Semiconductor, NEC and Siemens. This gold-plated promotional lapel pin from MIPS Computer Systems features an actual MIPS R6000 RISC microprocessor chip encased in acrylic. Introduced in 1990, the MIPS R6000 was a 32-bit RISC CPU that was the first to use the MIPS II instruction set. It was offered in speeds of 60 & 66 MHz. ​The R6000 was manufactured for MIPS by a Beaverton, Oregon based semiconductor company named Bipolar Integrated Technology (BiT). The R6000's ECL (Emitter Coupled Logic) technology was plagued with manufacturing issues causing numerous delays. ​Big customers like Sun Microsystems, Tandem Computers, and DEC decided not to go with the R6000, but instead wait for the upcoming MIPS R4000 64-bit CMOS processor that was anticipated to be faster, cheaper, and run cooler than the 32-bit R6000. One customer that did decide to offer these processors as an option to their customers was Control Data, offering up to four R6000 processors in each of their new Model 4680, mainframe-class UNIX "Infoserver" line of multi-processor computers in 1991. Bull Information Systems would also offer the R6000 CPU in their DPX/2 Model 510 line of Unix based network servers in 1990. 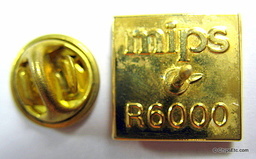 "MIPS R6000" is embossed on the back of the lapel pin. 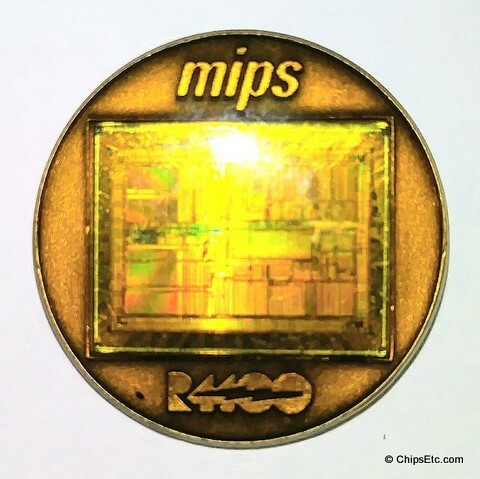 ​Metal and enamel promotional pin from MIPS that features an actual R4400 RISC microprocessor chip die. The MIPS R4400 was a 64-bit, .035 micron, CMOS microprocessor that was based on the R4000 processor, but offered higher performance. ​The improved R4400 chip offered a larger cache size and faster clock speeds (100 to 250 MHz) than the R4000, as well as some bug fixes.